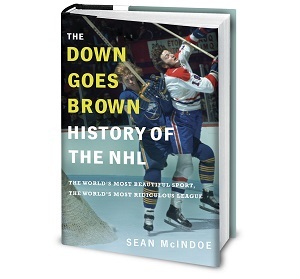 Down Goes Brown: Every Stanley Cup ever won: Did it really count? The Stanley Cup is the oldest trophy in North American pro sports, having been first awarded in 1893. It’s been won by many teams both professional and amateur, first as a challenge trophy and later as the league title for organizations like the PCHA, NHA, and eventually the NHL. All NHL fans know how many times their favorite team has captured the Cup, and chances are they’ll recite the number instantly. The Canadiens have won a league-leading 24. The Leafs and Red Wings are next, followed mostly by fellow Original Six teams, with more recent franchises like the Oilers, Islanders, and Devils having also won several. Every Stanley Cup banner that hangs from the rafters is a source of enduring pride for hockey fans, and the more the better. But let’s be honest … not all Cups are created equal, and occasionally a team wins one under less-than-impressive circumstances. From a purely technical perspective, those championships still count, and the record book duly notes them. But does that mean the rest of us have to sit by and listen to fans of those teams drone on and on about them? Sorry. Sometimes, a Stanley Cup just isn’t worth bragging about. But which ones? That’s a tough call, so I went through each and every Stanley Cup and determined which ones hockey fans should feel obligated to recognize as legitimate championships. Let’s start all the way back in 1893, as we try to answer the eternal Stanley Cup question: Does this one really count? Pre-NHL era, 1893–1916: This was during the days when the Cup was a challenge trophy, which means that anyone who could manage to get a half-dozen guys together could have a shot at it. Until 1912, you didn’t even have to wait until the end of the season; you just showed up with some guys and took your shot. Also, half the time the “puck” was a frozen pinecone and the game ended when one team’s goalie fell through the ice and sunk to the bottom of Lake Athabasca. The early NHL, 1917–1942: By this point the NHL had officially formed. But the league was in a transition period, which is to say that literally anybody could have a franchise as long as they had a few thousand dollars and an arena that wasn’t actively on fire. That led to an extended period when the Stanley Cup would be awarded because the Seattle Metropolitans edged out the Flin Flon Junior Knickerbockers, and the rest of us are supposed to act as if it matters. The only people who pretend this era actually counts are, in descending order of importance, history nerds, nonagenarian shut-ins, and Ottawa Senators fans. The Original Six era, 1943–1967: Here’s a little-known fact about the Original Six era: It had only six teams. If your office hockey pool had only six teams sign up to play, you would cancel it. Winning a league with six teams in it is basically the equivalent of winning the 2002 NL Central. Do you care who won the 2002 NL Central? Exactly. Montreal Canadiens, 1968, 1969: After the 1967 season, the NHL finally got around to expanding. But it did so too quickly, doubling the size of the league in one shot. That watered down the available talent badly, with all the new rosters basically stocked with minor leaguers. Even better, the league put all of those terrible new teams into one division, which meant one of them made the final every year. If you win the Stanley Cup by sweeping the expansion St. Louis Blues, which the Habs did both these years, it doesn’t count. Boston Bruins, 1970: They won the Stanley Cup by sweeping the expansion St. Louis Blues. Also, the guy who scored the winning goal wasn’t even touching the ice at the time. Montreal Canadiens, 1971: Montreal coach Al MacNeil benched Habs legend Henri Richard midway through the series, and MacNeil was fired shortly after even though his team won. If your first order of business after a Stanley Cup win is to immediately fire your head coach for incompetence, even you know it didn’t really count. Boston Bruins, 1972: The original engraving for this win listed the winners as “BQSTQN.” I’ll repeat that, just so we can all appreciate it: They somehow decided to put two Q’s in the word “Boston.” Maybe buy a vowel and try again in four decades, Bruins. "If we run the final numbers, that leaves us with a grand total of … zero Stanley Cups that actually count" - except for Dallas's win in '99? You're gonna feel silly when you read the rest of the article. "Dallas Stars, 1999: Hm. Well, it was nice to see Brett Hull and Eddie Belfour finally get Cup rings, and Mike Modano was pretty cool. OK, I suppose this one checks out. "So there you have it. If we run the final numbers, that leaves us with a grand total of … zero Stanley Cups that actually count. " At least one aneurysm here!!! I think I broke my phone in half in murderous rage.